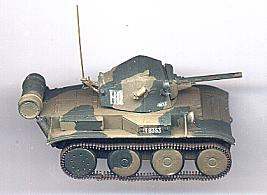 The Extratech A17 Light Tank Tetrarch is a delightful little model. It is a combination of cast polyurethane resin and finely etched brass parts. The track looks especially effective, being made from etched brass. I added one or two extras, in particular the aerial mount and aerial on the turret bustle. Assembly was straightforward, although handling some of the smaller etched parts calls for some patience and adept use of forceps. I purchased my Tetrarch from The Turntable who also stock other items from this Czech manufacturer.